what LUPEC is all about. I am immediately fancier in these people's eyes...and let's face it's true: belonging to LUPEC is a +10 fancy. Since I am not a fancy person by nature (you've met me, right? ), I could use those 10 points. Our October 2012 meeting at Vessel, though? Yeah, we might have to bump that up to +50. Why? Number One: Ice Program. I know Vessel isn't the only venue with an ice program about town, however, I think it's the only one with the capacity in-house to make 300 lb blocks of beautifully clear chunks of solid water, replete with two (two!) saws - chain and band, if you must know - on hand to carve said ice into manageable bricks, which are then parsed out to the bar for individual carving, crushing, ice picking, or what have you. The lucky ladies that attended got to see one of these blocks lifted from the magic water freezing machine (technical term) and, after its requisite rest, carved up. As you can imagine, it was a delight. Jim Romdall demonstrated and instructed us on the particulars of temperature and technique and the importance of timing. Two: Lunch! I struggled with making this number one or two, but I didn't want to make the ladies who couldn't take the afternoon (or day) off of work too jealous. However, I must say, indulging in a weekday afternoon lunch with an adult beverage (or in my case three) is quite nice. Mental health day indeed. Full disclosure: I might have napped when I got home. Three: Cameo McRoberts. One doesn't expect the aroma of lamb braising when entering a cocktail establishment, but that is exactly what happened. The delicious stylings of Ms. McRoberts, beloved fellow member and chef charmed us all. And yes, I believe we tried everything on the menu from the salads to the aforementioned deliciously smelling Braised Lamb French Dip. My favorite was the Muffulleta Sandwich, which fortunately for everyone involved, I ordered. All this tastiness was topped off with an unexpected surprise: a complimentary Old Fashioned ice cream concoction. YUM. Of course one could order off menu, but I didn't find that necessary on this visit. Overall, with its rotating bartenders and menus (both food and drink); fantastic back bar; and new airy space, Vessel 2.0 was a fantastic LUPEC host and is a delight any day of the week. Highly recommend! And if you see Jim, ask him about the ice! Huge thanks to Jim, Cameo, and their wonderful teams. 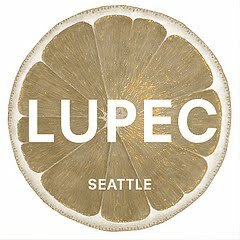 LUPEC Seattle teams up with Novo Fogo's Bars on Fire! For September's gathering, LUPEC Seattle participated in a convivial, combined event at Poquitos with Novo Fogo's established Bars on Fire series. If you haven't heard of Novo Fogo yet, it's time you learn about them! They produce an excellent line of cachaças, easily available in the Seattle area thanks to the tireless advocacy of one of the owners -- and LUPEC ally -- Dragos Axinte. Dragos is a welcoming host, and we were all given a special cocktail menu, developed by our two bartenders for the evening: Erik Carlson (pictured left) and Evan Martin (pictured right). Silver Cachaça, passion fruit syrup, cinnamon syrup, lime, mint, I.P.A. Barrel-Aged Cachaça, Amontillado sherry, orgeat, Combier Pamplemousse Rose, lime, lavender bitters. Silver Cachaça, pistachio orgeat, lime, absinthe, Angostura bitters. Barrel-Aged Cachaça, orange curaçao, cane syrup, mole bitters, coffee bitters. As with any LUPEC event, there was lots of sampling and sharing, and this time with Poquitos' delicious Mexican food available to accompany our cocktails. Our fearless leader stated the O Melhor was her favorite, and another member chimed in that its sherry, orgeat, Pamplemousse Rose and lavender were perfectly-balanced. The Cane Chopper was a light, yet dynamic drink, and Gaby's Punch was punctuated by an unconventional pistachio orgeat. Another at our gathering declared that the Nelson's Passage encapsulated Summer for her --"Summer's either a mint julep or this drink!" Finally, there was the classic, the caipirinha. These were served in mason jars for drinkers to shake before imbibing. This fun rendition of the definitive cachaça cocktail became a popular choice by night's end. While many folks associate cachaça exclusively with caipirinhas, thanks to Dragos, Erik, and Evan, we learned again at this month's meeting that it can also be an integral ingredient in other delightful cocktails, too. Thanks to them, all those who participated for another successful LUPEC Seattle night out!